Stem cell injections have been shown scientifically to help with pain reduction and improved function when injected into an osteoarthritic knee. There are over 200 growth factors in a stem cell recruitment therapy injection. 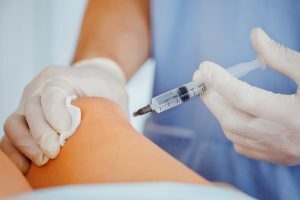 The injection has the ability to reduce inflammation, reduce pain, repair damaged cartilage, and potentially regenerate new articulate cartilage. It is a quick injection that requires a regular office visit and will likely feel just like a flu shot. A small slender needle is used to inject the stem cell recruitment therapy. Your physical activity does not have to be altered after the injection. The only restriction is there can be no use of NSAIDS medication, such as Motrin, Aleve, or Mobic, for at least 2 weeks. If it is not covered by insurance, the cost is $1,600. PRP injections is a process where blood is drawn out of your arm in the office. We then centrifuge your blood in order to separate out the platelets from the rest of your blood cells. These platelets are then injected back into the knee joint. While the platelets have growth factors, there are not as many as found in stem cell recruitment therapy. PRP injections tend to work as well or better than a hyaluronic acid injection. The entire process takes about 30 minutes and requires a blood draw of approximately 10 cc. Though PRP injections are not covered by insurance, the cost of the procedure is $380. Hyaluronic Acid is a synthetic fluid that is injected into the knee and helps to stimulate the synovial cells that line the inner part of the knee joint. This helps produce a more thick cushion-like fluid for the knee. In a normal knee, the fluid in the knee joint is thick like motor oil. However, when the knee becomes arthritic, it starts producing a fluid that has a water like consistency. After injecting the hyaluronic acid into the knee, it “tricks” the knee joint into producing a thicker more viscous joint fluid. Unlike the stem cell recruiting therapy and PRP, it does not have any growth factors. Effects of HA injections usually last up to 6-12 months. While most insurances will cover a percentage of the cost, the full price is about $600 per single injection. Cortisone is a steroid that helps reduce inflammation temporary and is excellent for acute pain relief. It lasts between 3 to 4 months and does not have any growth factors. However, during the 3-4 month time frame, the cortisone will wear off and the symptoms will return. Cortisone shots are usually covered by your insurance company. When it comes to treating an arthritic knee joint and chronic pain, there are several options we can provide that range in both efficacy and price. Prior to receiving any treatment, your coverage will be checked as benefits with insurances companies tend to change on a regular basis. To get more information on what would be the best treatment option for you, make an appointment with Dr. Stacie Grossfeld at Orthopaedic Specialists in Louisville, KY by calling 502-212-2663. Dr. Grossfeld has over 25 years of experience in orthopedic medicine and is a double board-certified orthopedic surgeon.